- Presented by Charlotte Smith. Produced by Alun Beach. The family-run Fuller’s Griffin Brewery was featured in Charlotte Smith’s BBC Radio 4 Farming Today show on 8 September, where she discussed the history of the brewery, the brewing process and the future of pubs. In the hop loft, Fuller’s Head Brewer Georgina Young talks about the process and ingredients behind beer, one of the UK’s favourite drinks. 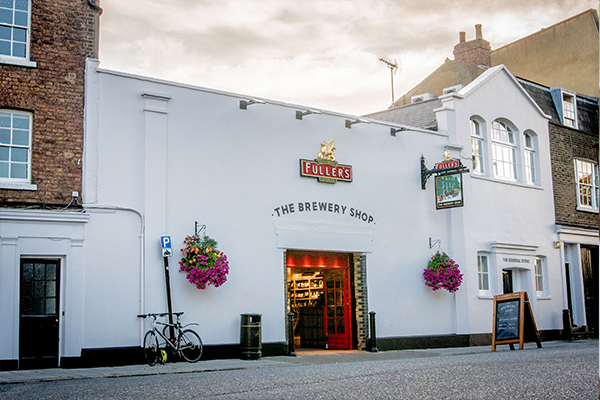 85% of all hops that are used at Fuller’s Brewery come from the UK, due to their wonderfully classic, piney, earthy and sweet aroma. Georgina Young goes on to explain that malt is “the soul of the beer”, adding that at Fuller’s only British malting barley is ever used in the brewing process. In the brew house, Georgina Young talks about how many varieties of beers Fuller’s produces and the trick to keeping beers consistent. However, beer isn’t the only thing Georgina Young gets involved in; George also has had a hand in looking at the brew of Fuller’s Brewer St. Coffee. Charlotte and Georgina end in discussing Fuller’s new Pilot Brewery which can be used to make smaller scale, ten-barrel batches which will help in new product development. The Pilot Brewery will make it easier to experiment with water, new hop varieties, strains of yeast, malt and other ingredients such as herbs and spices. Fuller’s Griffin Brewery is a landmark for those arriving or leaving London and a place that remains vibrant and alive. Finally, Charlotte finishes her tour in The Mawson Arms, the Fuller’s pub onsite at the brewery, one of nearly 400 pubs that Fuller’s owns. Charlotte talks to Jonathon Swaine, Managing Director of Fuller’s Inns, about the future of pubs and the change in customer preferences. In the current climate where pubs are closing their doors at an alarming rate and the drinking habits of younger generations continuously change, Jonathan explains that Fuller’s aims to retain pubs as beacons of their communities, whilst investing behind food which uses local, fresh ingredients. Fuller’s Griffin Brewery is a landmark for those arriving or leaving London and a place that remains vibrant and alive despite having seen two World Wars and a Great Depression. A familiar face to so many of us, the Griffin Brewery will remain a place that holds on to its tradition while looking forward to the future.